Lately in the news, popping up here and there, artists are losing their voices, canceling concerts due to “cold and chest infection” and suffering from vocal problems like edema, hemorrhage, nodules, polyps or granulomas —- Adele, John Mayer, Sam Smith and now Meghan Trainor have all experienced extended vocal silence due to major vocal cord trauma. The real truth is — it’s actually pretty challenging to stay in good vocal shape on tour. Amidst the grueling non-stop schedule, dehydration from air travel, lack of nutrition from fast food chains (there’s very little “green” food on tour except for iceberg lettuce and that is FAR from green…), the crazy media blitz’s, photo op’s, publicity, etc. Hopefully singers will start taking more care and be diligent about training their voices pre-tour, learn how to prevent damage, stay healthy and continue to escape the knife (not something you ever want to do – your voice could never be the same again). I find that even most managers and record exec’s and even the majority of vocal coaches, don’t know what I am going to reveal here in this article. I am always surprised by that – I guess it’s the “if-it-ain’t-broke-don’t-fix-it” attitude. However, with the voice, it’s too vulnerable an instrument to NOT be preventative with, because once it’s damaged, a singer is down for the count and often for too long. Why take the chance? And not only can you recover from almost any vocal problem – sometimes within two days if you know what you’re doing, preventative care helps you avoid breakdowns all together. Just by understanding how to take care and stock up with the right natural prescriptions in your medicine satchel and acting at the first sign of anything and you’ll stay in the safe zone. I’ve done it a gazillion times myself with my own voice (yes, I’ve been my own guinea pig) and with thousands of singers over the past few decades. And now I teach to all of my singers exactly what do to in a myriad of situations and how to diagnose symptoms. What followed next was a trip to Whole Foods (usually the only place that has everything) with a detailed shopping list. I sent him the instructions, which basically included along the lines of water-boarding, a vegan diet, massage and acupuncture (works wonders for vocal problems), a lot of down-dog and swallowing a mega load of supplements and herbs every 2 hours. Luckily, he had also just been at my studio in New York and I had given him some of my Chinese herbs to take on the road “just in case” (harder to find). Well, not only did he get his voice back, but he sounded amazing (you couldn’t tell there was any vocal problem at all) and he looked so chill up there under the lights, I was sure it was from sheer relief! We were both thrilled, thank goodness for natural remedies, knowing how to use them and a handful of tricks up my sleeve. He would not have made it without them. The good news is, vocal problems and burnout are all preventable and fixable if you are willing to do the work and follow instructions. The body is an amazing healing machine when you know the right fuel and elixirs to feed it. I have helped countless singers recover from problems as well as avoid the knife altogether. This is usually behind closed door stuff, but I wanted you, my faithful readers, to be armed with this info, so you can sing your heart out and know there’s a way to do it without wearing out and losing out! First off, I just want to point out the beauty of the word Healthy. Heal-thy. That amazing healing machine that the body is when you give it the right nutrition, rest and vocal prep! Green juice: celery, cucumber, sunflower sprouts, pea shoots, ginger and cilantro (Juice 3x a day) If you can’t get sunflower sprouts and pea shoots, add kale, spinach and any other greens. Nightly baths with Kneipps or Epsom Salts to reduce neck and upper back tension. Massage or Acupuncture to reduce throat tension. Yoga to reduce overall stress and tension. Meditation to reduce mental stress and depression. Over the years I have come to specialize in holistic care of the voice and fixing vocal problems mainly because of my interest in alternative care as a solution for chronic problems and my knowledge of the vocal instrument. I will say that there is so much more to it than I can go into in this one article. Vocal problems can arise from many different sources that I didn’t even touch on here. And of course nothing is more important if you are having problems than getting a diagnosis with a professional ENT (voice doctor) and getting treatment. But hopefully, I’ve given you a good head start here, enough to set things right quickly. 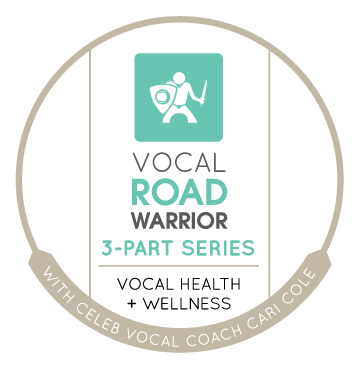 For more information on keeping your voice healthy and preventing damage, grab a copy of my Vocal Road Warrior 3-part Audio Series on Keeping Your Voice Healthy for free. Find out how to stop shredding your vocal cords, discover the best holistic natural remedies and keep your voice healthy on and off tour! Opt in and get instant access to this free series on our Home page at www.caricole.com.